We are searching for the best football talent on the Sunshine Coast. To help us to attract that talent SCFC will award a yearly coaching scholarship (excluding clothing) for a male player in each age group between 7 & 11 years old. To also ensure that the female players are given every chance we will also be awarding two coaching scholarships for girls aged between 9 & 12 years old. All you have to do is register for the trial and turn up for your chance to be selected for one of the scholarships. 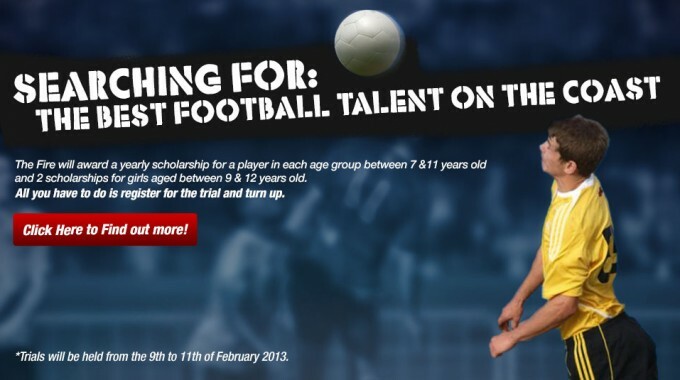 Trials will be held from the 9th to 11th of February 2013. To find out more about the Scholarships program including Trial dates and registration visit the Junior Academy Program page.